Our Mini Subs are powered by an electric motor that will allow you to move throughout an area of coral gardens without having to worry about using a snorkel or a mask. Sit on these unique underwater scooters and enjoy the brilliantly colored reefs as you peer out through the viewing window on the top of your scooter. A steady flow of oxygen is fed into the dome so you can breathe normally and pay more attention to the beauty that surrounds you. Each day we head out on our custom catamaran that is suited for small groups, for the best and most personalized experience. Enjoy a scenic boat ride around Key West as we embark on an adventure towards the 3rd largest barrier reef system in the world! Our highly trained crew will provide all the instructions that you'll need to make the best of your Mini Sub Underwater Adventure. 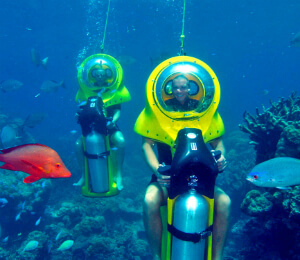 As you navigate the reefs at depths of about 20 feet, you'll experience a smooth, gliding feeling as you're propelled by the scooter. View the vibrant reef system with it's various coral formations and get up close with many species of tropical fish. With any luck you'll spot a majestic Sea Turtle as they gracefully make their way along the reef system in search of the perfect nourishment. Other species that are found along the barrier reefs are Triggerfish, Parrotfish, Pufferfish, Seargent Majors, Moray, Snapper, Grouper, and many more! Every tour is guided by a professional dive instructor to ensure a safe, enjoyable tour for all. We take your safety very seriously and want everyone to have the best experience possible, for this reason anyone that shows visible signs of impairment may be denied access onto our vessels. I have been to the Bahamas many times, but Mini Sub Underwater Adventure is one of my favorite trips! It includes everything that everyone should do here. As a Bahamas veteran, I can say only the best about this experience!